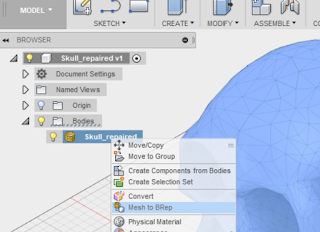 It has proved challenging to get existing meshes in to Fusion 360 in a form that can be used. 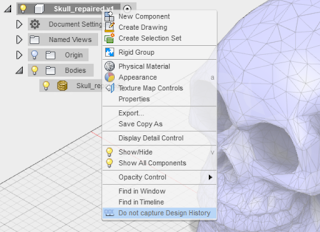 I am sure many people have existing STL files and other 3D models that they want to use. I've spent many hours over the last couple of days experimenting and reading articles before I came up with a solution that worked. I find Fusion 360's user interface unhelpful. In this case, why is it not simply greyed out instead of being completely hidden, I don't understand. 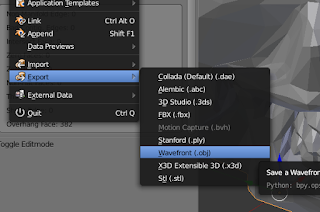 If you are looking at menus showing 'Mesh to T-Spline' or 'T-Spline to BRep', you are in the wrong place. 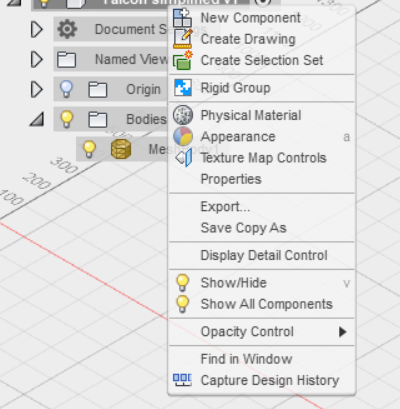 For most mesh imports, I would suggest using 'Mesh to BRep' from the Browser menu in MODEL mode. Boundary-Representation (BRep) is the format used for new bodies created from within Fusion 360. Although it can handle T-Spline and Mesh, only BRep has all the features. 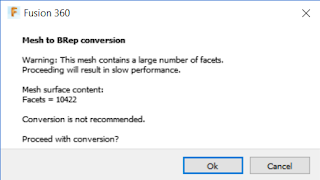 First Upload your mesh and wait for it to complete the import process. Open the model containing the newly uploaded mesh. It is likely to open in Sculpt mode. Swap to Model mode. Make sure the history is disabled, which it probably will be. Right click on the mesh body. If it has errors or completes but shows, in orange, as a patch, then you have more work to do. Good quality, manifold (solid body) models should convert correctly as a complete solid body. I found that meshes with holes or superfluous edges and faces would either fail to convert or complete as a patch instead of a body. I was unable to repair those in Fusion 360 and had to use an external tool to fix the mesh before importing. I tried several free tools in an attempt to find an automated process but failed to find a solution. I used, MeshMixer, MeshLab and FreeCAD but I could not get any of them to repair a non-manifold mesh where the mesh had other issues. I ended up back with my go-to tool, Blender. 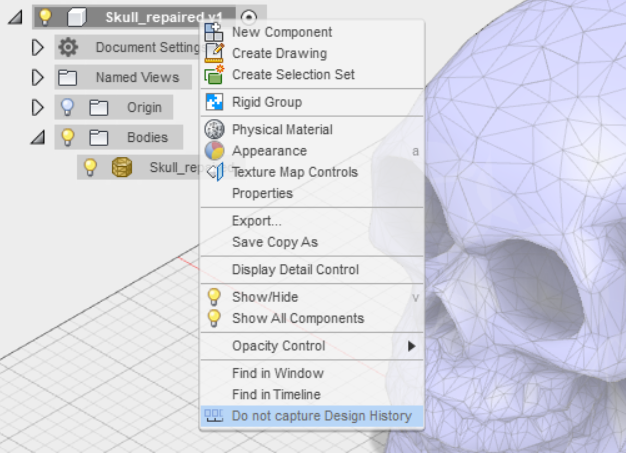 I used the Add-on '3D Print Toolbox'. This includes various checks that can be run to find potential errors and can highlight them to aid in finding a fix. 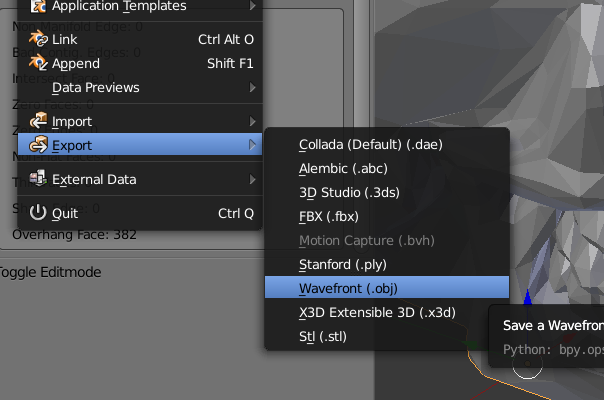 The 'Make Manifold' button does what it says. That alone fixed my mesh enough for it to work correctly in Fusion 360. As I expected to use this model multiple times, I chose to manually clean up all the errors found by the tool in Blender. That left me with a clean good quality mesh to import in to Fusion 360. I exported from Blender as an OBJ file. Remember to only output the current selection. Exporting to STL would work but I believe it will convert polygons to triangles which is not always desirable. I used Blender to subdivide the surfaces to create a smoother better looking model. When converting the more detailed model, in Fusion 360, it warned that the model might slow down the application and it did. From then on, there was a noticeable lag in processing operations. It's therefore worth noting that Fusion 360 is not ideal for working with highly detailed mesh type models. Once I had my model imported and converted I checked that the result behaved as I expected. It did, I had the full set of tools available for modelling.